2019-03-27 18:09:37 Lavender328에 의해 마지막으로 편집 됨. 레아는 펠리칸 타운 외곽의 레아의 오두막에 사는 마을 주민입니다. 레아는 결혼이 가능한 캐릭터입니다. 레아는 오두막 안에서 매일 아침 조각을 합니다. 오두막은 오전 10시에 열리지만, 플레이어는 안에 들어가기 전에 먼저 우정에서 하트 2개를 얻어야 합니다. 플레이어가 처음으로 오두막에 들어가면 이벤트가 시작됩니다. 하지만 레아가 집에 있어야만 합니다. Each day Leah wakes up at 10:00 AM and begins the day sculpting in her cottage. 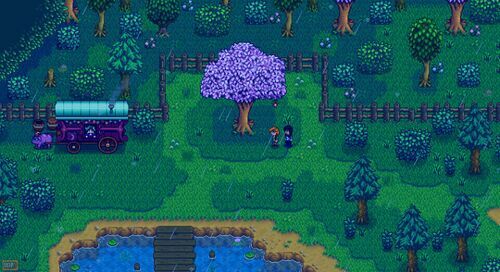 Unless players have achieved at least two friendship hearts with her they will be unable to enter her home. At 12, after sculpting, she often goes out to draw beside the pond in the woods, to Pierre's General Store, or sometimes to the beach in the summer. On rainy days in spring she goes to the The Stardrop Saloon at 5:30 PM. On the 16th of Spring, she has an appointment at the clinic. There seems to be variability to her schedule in the late spring. Some days she doesn't leave her house until 4pm. 10:00 AM Wakes up for the day, sculpts inside her cottage. 12:00 PM Leaves her cottage and walks west to the lake in the woods. Stands on the eastern shore of the lake and gazes toward the water. 4:00 PM Leaves the lake and walks elsewhere in the woods to draw. 6:30 PM Walks back to the lake in the woods. Stands on the western shore of the lake and gazes toward the water. 7:30 PM Leaves the woods and walks back to her cottage. 10:00 PM Moves around her cottage. 12:00 AM Goes to bed for the evening. 1:00 PM Standing looking at the river near her house. 4:00 PM Standing on the dock on the Pond in Cindersap Forest drawing. 12:00 PM Leaves her house. 12:50 PM Standing on the bank of the river, near the pond. 3:00 PM Walking to the pond. 3:50 PM Standing on the dock of the pond in Cindersap Forest, drawing. 6:30 PM Walking to the West side of the pond. 6:50 PM Standing on the West side of the pond. 12:30 PM Standing looking at the river near her house. 11:50 PM Leaves The Stardrop Saloon and walks back to her cottage. 6:50 PM Standing on the West side of the pond in Cindersap Forest. 12:00 PM Leaves her cottage and walks through town to The Beach to draw (She arrives at the beach by 1 PM). 7:00 PM Leaves the beach and walks back to her cottage. 12:30 PM Arrives at Pierre's General Store. 5:00 PM Leaves Pierre's General Store. 11:50 PM Leaves the Saloon and walks back to her cottage. 1:00 AM Enters her cottage. 12:00 PM Leaves her cottage and walks through Pelican Town to the east side of the river. 2:00 PM Arrives at the east side of the river above the Blacksmith, stands there gazing over the water. 7:00 PM Walks from Pelican Town back to her cottage. 11:00 AM Leaves her cottage and walks to Pierre's General Store. 5:00 PM Leaves to head home. 4:00 PM Leaves her cottage and walks through Pelican Town to the Stardrop Saloon. 5:30 PM Arrives at the Stardrop Saloon. 11:40 PM Leaves to head home. 11:00 AM Leaves her cottage and walks through town to Pierre's General Store. 5:00PM Departs from the general store. 4:00 PM Leaves her cottage and walks through town to The Stardrop Saloon. 11:40 PM Departs from the saloon and walks back home for the evening. If it's raining or during winter, she'll spend the day inside her cottage, exiting at 4:00 PM to travel to The Stardrop Saloon for the evening. She also spends each Friday and Saturday creating art at home, then socializing at the saloon. 12:00 PM Moves around her cottage. 2:00 PM Continues moving around inside her cottage. 9:00 AM Wakes up for the day, sculpts inside her cottage. 10:30 AM Leaves her cottage and walks through town to Harvey's Clinic for her annual checkup. "Hi. Here to see the doctor?" 1:30 PM Continues checkup at the clinic. "Do I look healthy, Doctor Harvey?" 4:00 PM Departs the clinic and walks to The Stardrop Saloon. 11:40 PM Leaves the saloon and walks back to her cottage. 5:00 PM Walks from Pierre's General Store back to her cottage. 12:00 PM Goes to bed for the evening. 8:00 AM Walking to the bridge near the small island South of her cottage. 11:00 AM Near the bridge at the small island south of her cottage in Cindersap Forest. 3:00 PM Walking to her cottage. 3:20 PM Outside the door of her cottage. 7:20 PM Arrives at the farm house. You can give 레아 up to two gifts per week (plus one on 그녀의 생일), which will raise or lower 그녀의 너와의 우정. Gifts on 그녀의 생일 (겨울 23) will have 8× effect and show a unique dialogue. Enter Leah's Cottage when she's there. You see her working on a sculpture. She discusses sculpting with you, and says "Once you get past the outer layers, the true nature starts to show..."
"It's the same with people." (우정에 영향을 미치지 않습니다) she agrees and says Oh! yeah, that's absolutely right! "I actually prefer the look of raw, unadultered wood." (우정에 영향을 미치지 않습니다) She says that there's nothing wrong with that and that she thinks there's lots of beauty to be found in raw untouched nature. She goes on to say as a human, she is interested in how we shape and interpret the world around us, she explains this as she is interested in 'art'. If the farmer is male, she calls you a pig, punches you and kicks you out. The scene ends. Otherwise, she acts surprised, saying "Oh! you're...? (blushing) Me too. That's good to know". Regardless of her blushing, she will hit you with her hammer and kick you out. The scene ends. She continues, "Although, I have to admit... It's not easy to pay the bills as an artist." "Why don't you have an art show in town?" (우정에 영향을 미치지 않습니다) She muses that it could help make Pelican Town a true art destination, but says she'd be crushed if nobody liked her sculptures. She says she'll think about it, and thanks you for stopping by. "Why don't you sell your art on the internet?" (우정에 영향을 미치지 않습니다) She says it's expensive. You see her arguing with her ex-partner on the phone, who is asking her to come back to the city she left. After the call, she tells you her story and asks if it was selfish to move out of the city to be an artist. "No, it had to be done." (우정에 영향을 미치지 않습니다) Leah responds, "You're right... I just wouldn't have been happy back there." "No, and your ex sounds like an idiot." (우정에 영향을 미치지 않습니다) Leah responds, "That's a bit harsh... But yeah, we had different priorities." Depending on your response in this conversation and the two-heart event, she'll either thank you for listening or briefly get angry. She tells you that she's been thinking about the art show or is saving for a computer, depending on your choice in the previous event. Leah is at your farmhouse door on any day but rainy between 6 AM and 11:30 AM. Leah says she has a gift for you, and you receive the sculpture she's been working on. It's called How I Feel About <your name>. Enter Cindersap Forest when Leah is there, in any season except winter. Leah is trying to reach a fruit from the large tree above the forest lake. She can't reach it, so you lift her onto your shoulders. She thanks you and says that if her art ever fails, you'll always be there to catch her. 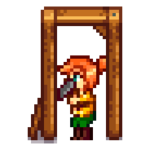 If you suggested an art show in her two-heart event, Leah is at your farmhouse door between 6 AM and 8 AM (except in winter) to invite you to her art show. Enter Pelican Town between 3 PM and 5 PM (not necessarily the same day). You arrive to find many others already present. Leah is happy to see you and nervously starts the art show. She thanks everyone for coming. Leah says she came to Pelican Town to draw inspiration from the beautiful surroundings and confesses that it really feels like home now. She presents her sculptures. "I haven't named this one, yet. She started out as an exercise in human anatomy, but I ended up seeing her through to completion. Her expression is intentionally unclear... is she embarrassed, amused, pained? I'll leave that for you to decide." (pause) "This one's called 'Post-Dimensional Nullspace'. It represents the boundary of human imagination. The shape and color came to me vividly when I was in a 'trance state'." (pause) "I've been calling this one 'Egg Heads'. I wanted to create an animatronic humanoid statue to toy with the viewer's ability to properly attribute personhood to a physical entity." (pause) "And the last one is called 'Wood Sculpture 3'. It's a celebration of my favorite sculpting material... wood." Lewis: "I'm proud of you, Leah! Events like this really breathe life into our little town!" Demetrius: "I love your art, Leah! 'Post-Dimensional Nullspace' is my favorite." Robin: "Great use of wood!" Penny: "Thanks for doing this!" Leah's ex-partner Kel comes out of the bushes. (Kel will be male or female depending on your player's gender.) Leah is annoyed and asks Kel what s/he is doing here. If you suggested the art website, Kel says s/he found her online art store and says s/he's the "Mr K" who kept buying her sculptures. Leah is disappointed, because she thought it was a rich guy who truly loved her art. Kel says she was "half right", implying s/he doesn't care about her art. S/he asks her to come back to the city. Leah refuses, saying Kel was never interested in her art until she became successful. If you suggested the art show, Kel says s/he came all the way from Zuzu City to see her sculptures and bring her back to the city. S/he claims to want their relationship to be the way it was before. Leah refuses, saying Kel was never interested in her art until she became successful. Either way, an argument ensues. You can choose to punch Kel or reason with him/her. If you don't punch Kel, Leah does instead. If you do punch Kel, Leah says "That was pretty violent, (Name)." Leah takes you to find a more secluded spot and admits the picnic didn't quite pan out like she'd wanted it to. Once married, Leah will move into the farmhouse. Like other marriage candidates, she will add her own room to the right of the bedroom. She'll also set up a small area behind the farmhouse where she'll sometimes go to work on a sculpture. On rainy mornings, Leah may offer you a gift she found while "mushroom-hunting": Chanterelle, Common Mushroom, Red Mushroom, or Morel. On mornings when Leah stays indoors all day, she may offer you Coffee or a gift grown in "a little pot out back": Wild Horseradish, Daffodil, Leek, Dandelion, Cactus Fruit, Fiddlehead Fern, Spice Berry, or Sweet Pea. She may also offer you a Salad on days when she stays indoors all day. On New Years' Eve (Winter 28), she'll give you a bottle of Wine. 레아 may randomly request an item at the "Help Wanted" board outside Pierre's General Store. The reward is 3x the item's base value and 150 Friendship points. 1.1: Added sculpture area behind farmhouse if married. 이 문서는 2019년 3월 27일 (수) 18:09에 마지막으로 바뀌었습니다.